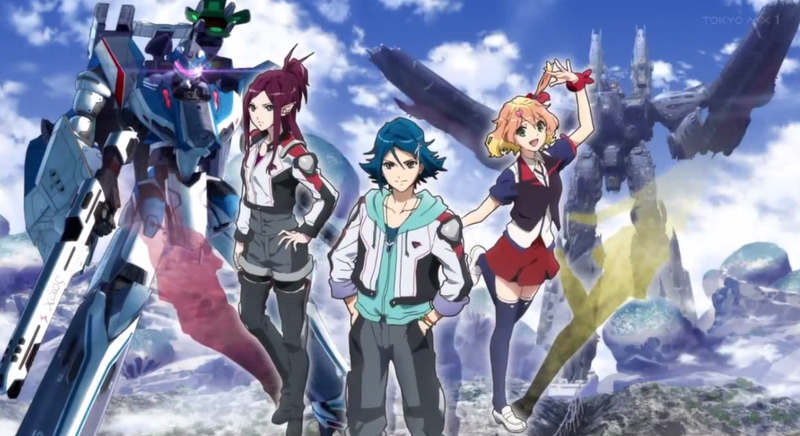 We have arrived to the Chapter 3 of Macross Delta, and let us see what has happened after chapter 1 on to chapter 3, shall we? Chapter 1 was left on a Cliffhanger with Hayate and Freyja falling to their demise. Luckily for our Heroes, they were saved by the third part on the classic Romantic Trio, Mirage. To put it short on what happens next on Chapter 2, is that they go to Ragna, Freyja goes to her Audition in order to become a Walkure member; the Captain is a Super Awesome Zentraedi; Hayato finds himself a chance to become a Delta member, and Mirage has a feud against him since she punched him and called him a no0b and naïve; but Hayato defended himself when he called her out for being too a naïve pilot or something like that. Needless to say, both Freyja and Hayato becomes members of their respective groups. From the point of view of the bad Guys, the Aerial Knights or something like that, they are trying to protect some sort of Princess or something, since their Civilization runs like a Kingdom, if it wasn´t obvious enough. Basically that was all of Chapter 2. Let´s go and see what Chapter 3 has for us! Chapter 3 starts were the second left off. Mirage will be in charge of Hayate´s education, much for her demise since she can´t stand him; but hey! We need that ship to grow! Hayate vomits on her because well…yeah. On any case, after that long day everyone goes to eat and a Cat fish or Mercat or whatever, steals some food like a Ninja and it looks like Hayate is allergic to them. On any case, after eating, Freyja goes to a department where most of the Girls of Walkure and Delta Squadron are, Mirage reads to her the military letter, ergo the Rules, and all of that jazz. Days letter and…Hayate in truth is a lazy bones and a nightmare for Mirage, since the guy misses all of his classes and even the Judo class made by that awesome Zentraedi Captain. On any case, the only class he is interested is in the flight one, since he doesn´t care about Culture, combat or Martial Arts. One would believe that he is Good at flying, but in truth he isn´t doing so hot right now…Also he gets dizzy easily too! On any case one can see with that the mental thoughts of Hayato in that Regard, he just wants to fly and do barely his job, which is to protect the Walkure Group Specially in a scene with Mirage where he ask her if she enjoys her job? Which Mirage responds saying that she is Warrior, so she only cares in protect, not in things like enjoying or stuff like that! On the side of Freyja, she in truth isn´t doing so hot either, since her singing and Dancing falls off on the training, also the energy that makes the Var calm down doesn´t appear. Still, she has proven two times already that she can bring enormous quantity of such Energy in order to do the job ; but it looks like it is only when something is in Danger, ergo her life or a City. Hayate´s Final Exam will be next and it will be a mock fight against Mirage in a Valkyrie. Still Hayate looks to be more interested with catching that dang Ninja Mercat. Still both Freyja and Hayate gives themselves support at their own style, which is to mess with each other, but more on that later. The Mockfight starts and Mirage is beating the crap outa him with Splatoon…I mean paint bullets. Hayato ahs enough of the AI that , according to him, was getting in his way, so he deactivates it…Needless to say the things took a turn for the worst since he starts losing the control over his Valkyrie. He doesn´t want to eject and the automatic pilot has been blocked. Meanwhile Freyja singing isn´t so hot, but Mikumu, Walkure´s leader, decides to show the Dogfight of Hayato Vs. Mirage. Mikumo tells her that he is fighting on his Battlefield, What is her Battlefield? And with that Freyja starts singing and even making a Dance. At the same time, Hayato regains control of his Valkyrie and manages to salvage his plane. He does a lot of moves that resembles the ones that the Mercat does in order to get away with it and he defeats Mirage. Still one of Delta Squadron comes,Messer, a Guy that is all serious and Bitter, and shoots him telling him that the real fights aren´t so gallant like this one. Still both Hayato and Freyja has shown to the others that they have what it takes to be a part of the team! Later Hayato gives his thanks to Mirage and apologize for being such a bad Student, and he says that while he doesn´t like fighting, he will do it; but on his own style. So now he will study know for his own free will, with Mirage. Now these two chapters weren´t as good as the first one, but still managed to be entertaining in their own regard. I mean we got the development and the personality of our 3 Main characters. And that´s a good thing! Specially how they will interact with each other and how the Romantic triangle will be made. I mean Hayate y Freyja enjoy to mess with each other, they say some nice things to the other only to continue saying them something mean, it is in truth a truly enjoyable and funny way on how they try between them. Talking about the design of the characters, or rather about the Art style…There is something off with them. I mean, sometimes they look great but on the next scene they look very weird and bad, like if the art is inconsistent and only helps in certain points of view or angles. Ironically that doesn´t happen with the Zentraedis! They look awesome all the time! Continuing, obviously for the nature of the chapters, the action wasn´t as hot as the first chapter. Still certain animation regarding that Mercat was truly good enough, and the “Slice of Life” segments were very enjoyable! Although they weren´t awesome, just ok/enjoyable…And that is good! Still I would like that in the next chapters we get a little more of that crazy battlefield action mixed with a weird Idol concert! It was truly good and I believe that if the Team manages to balanced it well, it can become truly amazing! Also who do you want to ship Hayato? With Freyja? Mirage? Both? None? Other Chick? Yourself?! This and any other thing you can tell it in the comments section! Anyway, those are my thoughts as of right now and see ya at 3 or so Chapters!